The first Burwood meeting is coming up on Saturday, 13 February 2010 and it's "Market Day". Members are welcome to sell their wares, surplus stash and other good things from 11am. Trading must cease during meeting but traders may continue during afternoon tea if desired. The AP&Q AQC challenge is a wonderful opportunity to share your contemporary or traditional quilts. The theme for 2010 is "Remember". Prizes are awarded based on the interpretation of theme, excellence in design, and craftsmanship. Each work must measure a minimum of 100cm (39 1/2in) on each side up to a maximum of 150cm (59in). The participating quilts must be available for eight months, from April 2010 to November 2010 and will be exhibited at the Australasian Quilt Convention, Melbourne April 29 – May 2, 2010 and selected Craft & Quilt Fairs around Australia and in New Zealand. Download the entry form. Remember - completed entry forms must be postmarked no later than 10 February 2010! Entries for "Classic Oz Rocks", the Art to Wear section in the Sydney Quilt Show 2010 have now closed. Preparations for the the exhibition are progressing well and the Guild is pleased to advise that our Retrospective Guest Exhibitor for 2010 is Cheryl Bridgart who last exhibited in 2002. Cheryl's studio/gallery is in old horse stables in down town Adelaide. Cheryl is an internationally recognized master of the Art Form of Thread Painting creating portraits, fantasy pieces, animals, landscapes and Wearable Art. Cheryl's inspiration comes from her dreams, nature and life. Cheryl has taught and exhibited extensively overseas. Cheryl was the winner of The Australian Tourism Commission/Qantas / Australian Arts Councils Dreamtime 96 “National Billy Can Art Award”. This Image was used to promote Australian tourism world wide. Cheryl's artwork is in numerous collections including The Powerhouse Museum (Sydney), Plescher / Palmer (USA); Madeira International Art Collection (UK); Hemeji (Japan) and the Victorian State Opera. 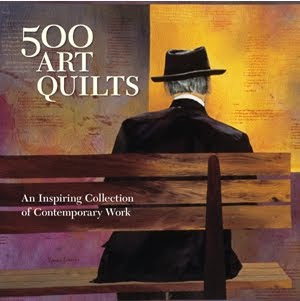 Congratulations to Guild members Alison Muir, Diane Firth, Beth Miller and Brenda Gael Smith whose work has been selected from over 2000 entries for inclusion in the book 500 Art Quilts that is due to be published in March 2010 available for sale at the end of January.